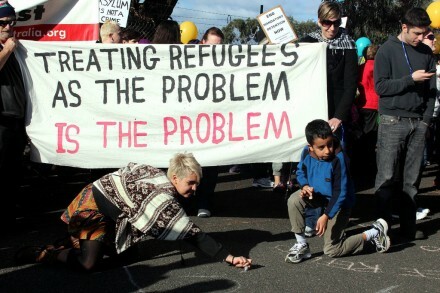 The ferocity in Australia of the current debate around asylum seekers arriving off Australia’s shores demonstrates a shift in political discourse and public opinion, over the last few years, from one of compassion to inflammatory and exaggerated concerns about national welfare and security. The ability of states to manage and control their borders and who they admit into their territory is a fundamental tenet of sovereignty. The challenges to this principle posed by those designated by the Australian state as ‘irregular maritime arrivals’ (IMA), but more colloquially known as ‘boat people’, has become a highly toxic political issue. At stake is not only the ability of those in genuine need of humanitarian assistance to gain refuge but Australia’s international reputation as a regional model of international human rights and justice. Vilified as ‘illegal’ and ‘queue jumpers’, asylum seekers arriving by boat off the Australian coast in recent years in relatively small but increasing numbers have become the subject of intense public debate. The Labor government’s reintroduction of offshore mandatory detention, first introduced as the ‘Pacific Solution’ under the Howard Liberal government, has been criticized as insufficiently draconian to deter future arrivals on the one hand and inhumane and in contravention of Australia’s international human rights commitments on the other. As a dominant election issue, the opposition Liberal party under the leadership of Tony Abbott has promised to place national security rather than humanitarianism at the heart of its manifesto, pledging to ‘turn back the boats’ if elected to power. Elsewhere, there have been calls for Australia to rescind its commitment to the 1951 UN Refugee Convention. But does the volume of numbers arriving justify the increasingly xenophobic political rhetoric, or are legitimate asylum seekers being used as a political tool to gain populist electioneering points? Australia is one of the few signatories to the 1951 UN Refugee Convention and its 1967 Protocol in the Asia Pacific region. As such Australia has committed to protect and support refugees and, as stated in Article 31 of the Convention, ‘not impose penalties, on account of [refugees’] illegal entry or presence’. 2. An onshore element, which ‘provides protection to persons who have entered Australia and who engage Australia’s protection obligations under the Refugee Convention’. The latter component includes those that arrive by boat but also those arriving through more conventional transit routes with valid visas who claim asylum upon arrival. The Australian government has adopted a two-tier approach to those seeking asylum onshore. While non-IMAs are often given a bridging visa and allowed into the community while their asylum claims are considered, IMAs are transferred to the remote islands of Nauru or Papua New Guinea’s Manus Island, outside of Australian jurisdiction, for offshore processing under indefinite mandatory detention. Considerable criticism and concern has been expressed regarding the conditions in off-shore detention centres and the detrimental effects on the mental health of those detained, especially of children. By indefinitely detaining IMAs, the Australian government is effectively criminalising them contrary to Article 31 and, as argued by the Australian Refugee Council, falsely labelling them as illegal. The evidence would suggest that those arriving by boat, in general, actually have a stronger case for humanitarian protection than non-IMAs. In 2011–12, of the 7035 non-IMAs who sought refugee status 44 per cent were successful, while of the 7379 IMAs, largely from Afghanistan, Iran and Sri Lanka who were considered, 91 per cent obtained refugee status. While Australia’s humanitarian protection program makes a significant contribution to regional protection, evidence would suggest that this is small in relative global terms. According to the UNHCR, ‘by comparison, asylum levels in Australia continue to remain below those recorded by many other industrialised and non-industrialised countries’. Of the 479,270 asylum applications made in 2012 across 44 industrialised countries, Australia received approximately 3 per cent of the total. As a relative proportion of the population this was below Malta, Liechenstein and Luxembourg, amongst others. Yet Australia spends inordinate amounts on its security apparatus to manage its asylum program. For example, the Department of Immigration and Citizenship was allocated a budget of $2.87 billion for 2013–14 for the management of offshore asylum-seekers detention centers. Yet, despite the policies of deterrence, the numbers willing to undertake the hazardous journey to reach Australia’s shores, while small, has grown — the last point being consistently emphasised in the Liberal opposition party’s attack on the incumbent Labor government. In 2010–11, 4940 ‘boat people’ arrived. In 2011–12, this figure reached 7983 and the numbers continue to rise. But the alarmist rhetoric that Australia is being swamped by ‘boat people’ does not stand up to scrutiny, as UNHCR statistics demonstrate. As a sovereign nation, Australia has every right to determine its migration policy. But cynical depictions of ‘boat people’ as a threat to the nation have been recklessly proclaimed in the pursuit of votes. By elevating security concerns, and other ill-founded fears, claimed to be caused by a relatively small cohort of potentially legitimate asylum seekers above Australia’s voluntarily agreed humanitarian commitments, Australia threatens to damage its exemplary reputation in the region and deny those with legitimate humanitarian needs the sanctuary they seek.